"Huh? What? Were you talking to me?" Beginner woodworking strategy refers to exactly that—a plan of action to complete your woodworking project. Procedural basics remain the same regardless of project complexity, your skill level, or the materials used. Let's face it, many projects do not get done. A lot don't even get started. At West Hills Wood, we have a bunch of house projects that need to get done but keep getting "re-prioritized". Part of the problem is that to do things right will take more time than we have any given day. At least that's what we tell ourselves when we'd rather spend the afternoon chasing the dog around. So we came up with a beginner woodworking strategy to help motivate us to get done. Ask yourself why you are making this particular piece. Do you need a bookcase, shoe rack, or gift box? The end use will help determine what type of materials, finish, and accuracy is needed. Obviously, a corporate gift requires a higher level of workmanship than a shop-related box. Both should be built to your best ability, but more attention to detail is called for with some pieces. At West Hills Wood, we are capable of producing very high-end drawings. But our shop plans often consist of nothing more than a quick rough drawing with dimensions. We might even use a list of dimensions and skip the drawing part, depending on the complexity of the piece. The key here is that we always have a list of the parts we need, the parts we have, and the parts we have used. Your beginner woodworking strategy is also on the list. Drawings help keep everything in perspective. We are also inclined to construct small models out of paper. This gives us a solid visual representation of the project and often gets the kids involved. From your parts list, you can determine if you need 10 feet at 3 inches or 5 feet at 6 inches. These are very different things. After several projects, you may already have some leftover materials on hand. You needn't rethink your entire beginner woodworking strategy for every project that comes along. Don't forget the hardware. Always keep lots of screws, nails, and glue at the ready. Empty screw boxes are one sign of a busy shop. 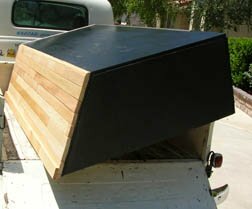 The type of raw lumber needed will often be dictated by the project itself. 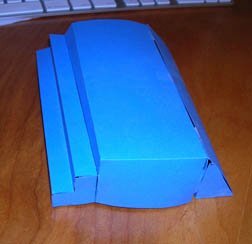 Large cases can be built of plywood where small boxes need thin sliced pieces. An intricate project might call for something special like walnut, oak, pecan, or cherry. Think about the project character as well as your own preference, cost concerns, and availability of material. With your drawing in hand, think about how to actually make the cuts. What order will you work? Sides, bottom, top? Maybe bottom, top, sides will work better. Do you have a table saw or chop saw? If all you have is a hand saw, that 8-foot bookcase project should get shelved for now. Now is a good time to also think about moving the finished project. Will it fit through your door? Will you need to carry it up stairs? Will you have to deliver the thing across town? Your beginner woodworking strategy should address this. 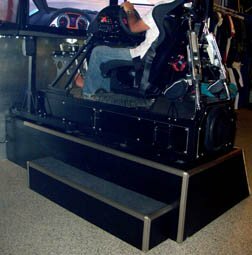 We recently built the wood stage shown here for an auto racing simulator. The model (the blue folded paper image) sold the concept and gave us many ideas on how to construct the piece. Strength was an issue due to the machine weight plus that of a driver. But we also had to consider moving the finished piece from our shop to the store. As you can see, the stage is longer and wider than our truck bed. If you've been waiting for a special project before plunging into the table saw world, set your sites realistically and allow time for a learning curve with the new tool. 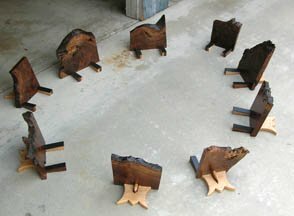 Then again, at some point in your woodworking you will find that new projects require only materials and time, not more tools. Then consider yourself "arrived." Sooner or later you'll have to stop thinking and start doing. We've found that once we have a drawing, the ball is hard to stop. We've also found that if we're deep into a project's construction, our brain shuts off to the outside world and we're not much good for anything else until done. Plan your cuts to maximize the raw boards. Dry-fit joints to adjust clamps and ensure alignment before adding glue and committing to nails. Make sure you have enough space to work. We built an 8 x 8 foot bookcase for a store a couple of months ago and the thing took up two car spots in the garage during assembly. This came as no surprise as we included it early in our beginner woodworking project strategy (we like to actually park our cars in the garage). Follow through on the project. Don't quit part way. If you must abandon the game, see if you can figure out where you went wrong with the bigger picture. Did you overestimate your skill? Do you lack some tool? What the heck happened? Learn from it and move on. When the project is complete, allow yourself to feel good about it. Don't get caught up in that dented corner or imperfect finish or slightly off size. Ask yourself: Can you build another one better if you had to? If the answer is yes, then you win. If the answer is no, then you don't need a beginning woodworker website to help you.